Cracked windshield? Salt + Ethanol + Repellent.. Fixed! Who would have thought a few ingredients you find in a regular home could fix or hide cracks and chips in a windshield. 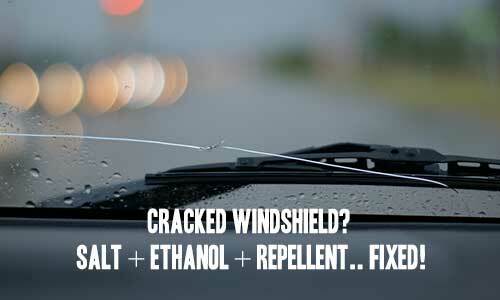 Windshield cracks make your vehicle look bad and may cause glare that adversely affects your driving. You can hide a crack with a few simple supplies, but this is a temporary fix. It does not solve the structural problem, which eventually needs to be addressed. Have you ever tried this? Remember this is not a permanent fix as it doesn’t add structural value. This little life hack is for cosmetic purposes only. Thanks for reading and be sure to share this info with your friends using the social share buttons below. Talking about social stuff, consider liking our Facebook page to keep up to date with our articles. Check out our other articles for more mental scoops!